The tourism business has never been easier or more fun than in Vacation Mogul, a Time Management game that challenges you to make more money than you ever dreamed possible! You'll become one of the rich and powerful as you buy and sell land, turn bungalows into ritzy hotels and build specialty shops and other attractions, all with a click of your mouse. Just be sure to keep one eye on your resources and the other on your bottom line! Crunch your way through 200 amazing levels! Win gold coins and build the highest possible Inn for your minions. Combine spells and discover amazing powers in this great swap and match adventure. Use your match making abilities and administrative prowess to build a 5 star Inn! The greedy Mr. Lyar has decided to sell a small hotel, and put an employee and his three kids out on the street! Help the three children follow an ancient treasure map across an island and save the small hotel! Escape from a strange coconut monster and get help from the three island spirits, Pah, Kom, and Boh in this Match 3 game. 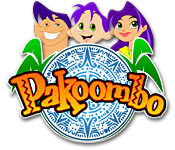 Take on quests and get help from the islandâ€™s population in Pakoombo!